Edie C · Fiction · In the Library · Mystery · Quick Read! A Holiday Yarn, written by Sally Goldenbaum, is the latest in a series involving the Seaside Knitters. The setting is the small New England town of Sea Harbor during the Christmas holiday. 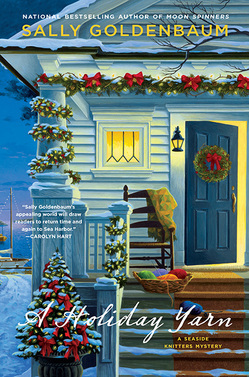 You then knit in a murder surrounding the opening of a local bed and breakfast and without slipping a stitch, the knitting club of Sea Harbor sets out to find the murderer and solve the crime in time to restore Christmas. The sense of friendship and warmth flows through the storyline as the Seaside Knitters solve another mysterious tale. This book is a quick read and yet an intriguing page turner. During the story, the knitting club talks about their Knit-a-Square project which is explained at the end of the book where the author adds a touch of humanity and a link for those knitters/readers who can help. The story’s characters would meet up to knit hundreds of eight-inch squares for orphaned children in South Africa who have been infected with AIDS. These squares, of various colors, were sent to volunteers from Soweto and made into warm blankets for the orphans. To read more about this project, look at the website: http://www.knit-a-square.com. Being a knitter myself, I found this link an added bonus to the book. I now have 8 squares of my own completed and look forward to sending my first package to South Africa. 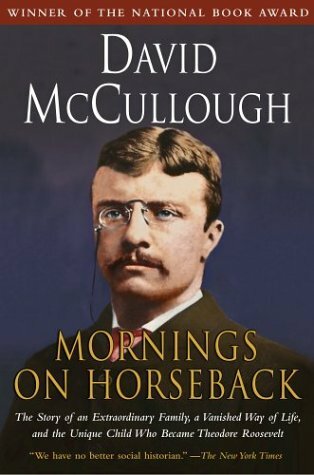 Mornings on Horseback by David McCullough is an interesting biography of young Theodore Roosevelt that reads like a novel. This biography covers Roosevelt’s “growing up” years beginning by painting a picture of a 10 year old asthmatic child and ending with the child’s transformation into a grown man with political ambitions. Along the way, McCullough also describes the rest of Roosevelt’s immediate family. McCullough goes into detail describing Teddy Roosevelt’s father (the first Theodore Roosevelt, whom Teddy adores), his mother, Mittie (a vibrant Southern belle), and Roosevelt’s two sisters and a brother. Mornings on Horseback is a well-researched book which presents a vivid picture of life in the world of the 1860s-1880s when Teddy Roosevelt grew up. McCullough gives the reader a glimpse into life in New York in the 1800s as it was experienced by the city’s well-to-do families. McCullough pieces together information from numerous family letters, diaries, friend and newspaper accounts, and other research documents to write a seamless story of the youth of a future president. David McCullough is an award-winning author, including a Pulitzer Prize for his work about another president, Truman. His clear, well-paced writing makes Mornings on Horseback a pleasure to read. This book is recommended for U.S. History lovers, readers of biography, and anyone who enjoys a well-written piece of literature. 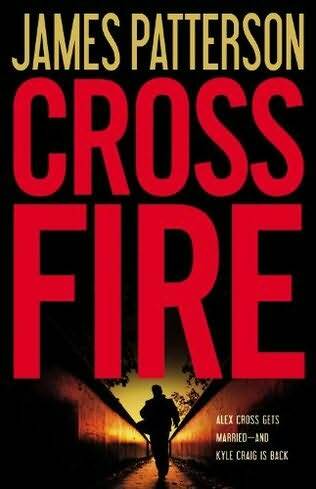 I just got through reading Cross Fire by James Patterson. He writes great crime thrillers. It was very good and it definitely kept me in suspense. It follows the Alex Cross series that he writes. This is the 17th book in the series. Alex Cross is a detective that solves murders of the worst kinds. In this one, he’s finally about to get married to his longtime girlfriend, who also happens to be a detective. But the wedding is put on hold because of some murders that have taken place in Washington D.C. Crooked politicians are being killed off. Then an old enemy of Alex’s reappears to try and kill Alex and his family and will stop at nothing to do it. This book has plenty of action, deception and suspense. Another reason I love Patterson’s writing is because the chapters are only 2-3 pages long. His books are very quick reads and keep you in suspense to the very end. I highly recommend this to anyone who is a fan of crime thrillers!!! 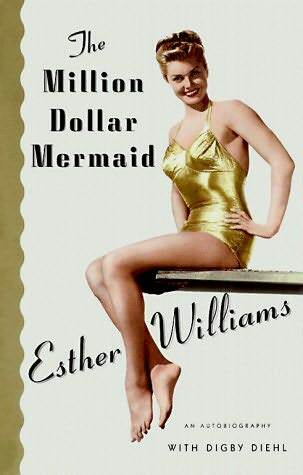 You can thank Esther Williams for basically creating and glamorizing the world of synchronized swimming after starring in a number of old Hollywood “swimming musicals.” I found this autobiography of her life and experiences in old Hollywood intriguing because you get the inside dish on what it was like to be in Hollywood during its real heyday – Williams offers dirt on what it was like to work with everyone from Clark Gable and Gene Kelly to Lana Turner and Bette Davis. While I love celebrity biographies, this particular autobiography definitely seemed like Williams was trying to present herself in a certain way. The writing left a bit to be desired, but if you love watching Esther Williams’ movies you’ll enjoy this read. You’ll find out how she became one of MGM’s leading ladies and created a movie genre all her own. Having never seen one of her movies (“Neptune’s Daughter,” “Take Me Out to the Ballgame,” and “Million Dollar Mermaid” to name a few) I’m definitely going to check a few out. I never would have thought to pick up this book if I hadn’t read so many glowing reviews. 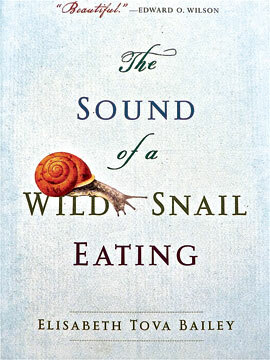 The Sound of a Wild Snail Eating encourages you to read the book at a leisurely pace – it’s a small book that you won’t feel compelled to “power through.” I’d argue that it is best suited for reading before bed or early in the morning. This is essentially a mini-memoir that focuses on a period in Bailey’s life when, struggling through an illness that leaves her effectively incapacitated, she finds herself engrossed in the life of a wild snail. The snail was a surprise guest, smuggled in amidst a bunch of wild violets brought by a friend. The snail provides a sense of companionship for Bailey and the author eventually devotes a great deal of time to learning more about the seemingly unobtrusive snail. It’s impressive to have stumbled across a writer who can make the life of a snail seem incredibly interesting. The fact that she motivated me to want to learn more about a creature I was once repulsed by is a testament to her writing. It’s a peaceful read that I’d definitely recommend.